On Monday, October 29, 2018, the GTU community held an interreligious service remembering the victims of the horrific shooting at the Tree of Life Community in Pittsburgh and other victims of violence and intolerance, and pledging our continuing work toward a pluralistic society in which all lives are cherished. Dr. Robert A. Rees, director of Mormon Studies at the GTU, offered this refection as an op-ed for the East Bay Times. We are pleased to share it here. How does one begin to put one’s heart and soul, let alone one’s mind, around the massacre of Jews at the Tree of Life Synagogue in Pittsburgh during last week’s Shabbat? Deemed “the deadliest attack on Jews in American history,” it stands as a stain on our sense of ourselves as a nation that welcomes and provides safe haven for those of all faiths. Eleven American Jews shot to death in a sacred space on a sacred day. How does one respond to such an assault on our identity as an open, tolerant, pluralistic society? How do we begin to heal? A group of believers from the world’s major religions who gathered on “Holy Hill” in Berkeley late Monday afternoon pointed the way. 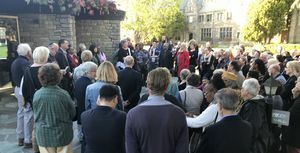 Members of the interfaith community known as Graduate Theological Union, one of the world’s most distinguished schools of higher religious education, gathered to speak, sing, and pray—to share in one another’s grief, to let the light of their respective faiths shine as a beacon against the darkness and hatred that led to such violence. Rabbi Lehmann spoke of the violence against other sacred spaces, including black churches in the South and Muslim mosques in the Midwest. Others who spoke at the vigil included Dr. David Vásquez-Levy, President of the Pacific School of Religion (PSR); Rev. Rosemary Bray McNatt, President Starr King School for the Ministry; Dr. Hatem Bazian, co-founder of Zaytuna College, the first accredited Muslim undergraduate college in the United States , and Dr. Rita D. Sherma, Director of the GTU's Center for Dharma Studies. Indeed, those of all faiths and those of no faith cannot rest until it comes.